I have a great guest post to share with you today. It's the first one ever here on Half Baked and I even broke posting schedule to put it up. So today Michelle Pino, who is from Skana spa in upstate New York, has a great spring cocktail for you guys. I think I've mentioned before I don't really drink - I pretty much exclusively drink vodka (including mixes), cocktails and mango daiquiri. Yes, I like girly drinks. And I'm also pretty young, so give me a bit of credit for not liking wine or hard spirits yet. Point is, while I haven't tried out this recipe myself, Marnie and I were thinking of throwing a cocktail-bar kind of birthday party for ourselves later on in the year and this will definitely be on the list. 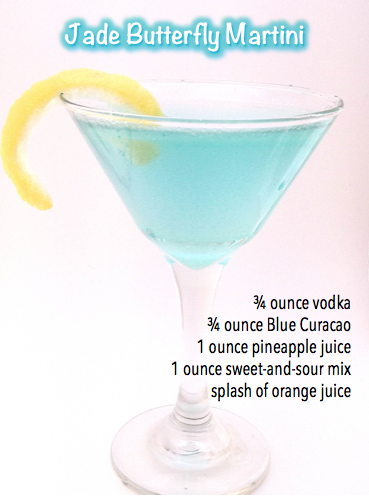 I absolutely love pineapple juice (or any juice really) with vodka, and this is a great combination. For those of you who don't know, Curaçao has an orange-like flavour and is a little bitter, which is why the pineapple juice compliments the taste. Well that's enough from me today. I'll let Michelle take over and tell you all about this delicious Spring cocktail - perfect for an Easter brunch or Spring drinks with girlfriends. It may not be Spring in Australia, but it's hot enough where I am for me to want to try this now. P.S. - Check back tomorrow for one final Easter recipe from me. It's a good one, even if it is a throwback! Spring has officially begun, and even though it might not feel like it in most parts of the country (I'm looking at you, fifty degree weather!) it's time to start looking ahead to those garden parties and backyard brunches. Sunny skies and day trips to the park are on the horizon, so keep your chin up and fake it until you make it by throwing a fun little party to usher in warm weather. Nothing screams "Spring is here!" quite like a light, colorful cocktail, so break out those martini glasses and whip up this signature drink that's sure to impress your guests! Shake all ingredients and strain over ice in a chilled martini glass. And there you have it! Mix up a batch of these, relax on your deck, and impress everyone at Easter brunch. The fun thing about kicking off spring with a party is that you have a chance to create a signature cocktail—something memorable that your friends will immediately associate with you in the future. This light, pretty little number is sure to win over friends with its yummy taste and festive color, so why not make it your signature drink this season? Happy spring, everyone! About Michelle: Michelle Pino has provided these tips in hopes to educate others on how to lead a more organized and less stressful life. Michelle believes a more organized approach to tasks will result in more completed goals. Her hobbies include crafting, reading and learning about healthy lifestyles. Michelle is thankful to have had the opportunity to work with Rebecca and together share their ideas on “Half Baked”. If you guys are interested in some more recipes from Michelle let me know! And if anyone else wants to do a blog swap, or guest post over here, feel free to shoot me an email. I will always reply. Check back tomorrow for some final Easter treats! Hi! I'm Bec, a 19 year old girl from Brisbane, Australia, who is just trying to create simple, healthy yet delicious meals on a uni student budget. I hope you enjoy my ramblings.